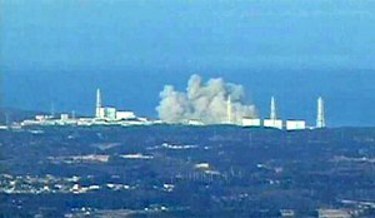 Since the first explosion occurred at the troubled Fukushima Daiichi nuclear power plant on March 12, steam and smoke carrying radioactive iodine and cesium has been blowing east, out to sea. General opinion has been that it is fortunate the cloud is over the ocean, not forming over the rest of Japan or China. However, the consequence for marine life and ocean water could be equally harmful in the long run. Last week, the Japanese government reported that higher than normal levels of radioactivity was detected in rainwater in Tokyo. Radioactive rain has almost certainly been falling into the ocean as well. ← What will our Energy Legacy Be? Hoping for the best. Japan has been doing preventions for the leak. Hope they find away to permanently remove all the radioactive in the ocean.